My friend Titch, international gamer extraordinaire, attended Salute 2011 in London this Spring. I asked him to get me a copy of Hail Caesar and a couple boxes of plastic Perry WOR figures. He succeeded in his mission! 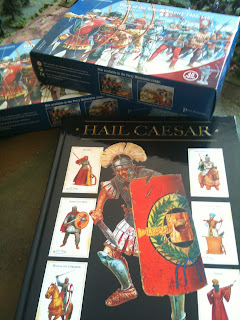 I had originally intended to use HC for future 28mm Roman & Celt armies, but after doing a little reading of the rules, and looking at some pictures of a WOR game Rick Priestly posted on the HC yahoo groups site, I think I just might have a go at playing a WOR game using these rules. I'm sure I'll get around to it sometime, and I'll be sure to post some pics and a battle report. I'm actually pretty excited about these rules and figures and can't wait to get started clipping and gluing! We are definitely entering another "golden age" of miniatures gaming with lots of great plastic figures coming out (Perry, Warlord Games, Mantic, etc), and some fantastic new rules too from all the ex-GW guys! I was browsing YouTube looking for videos of Salute 2011 and just stumbled upon a video with my friend Titch in it. You might remember him from the DBA game post a while back. Yes, he's the loud American gamer in the Old Glory T-shirt! Way to go Titch...now get busy painting the rest of your War of the Roses figures so we can play that massive game we've been talking about!